Home > GRISAILLE "THE PAINTED SKETCH"
Follow along as Rob Liberace creates a figure drawing with oils on paper using a monochrome palaete of primarily brown and white. 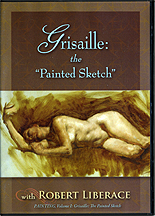 Also known as "grisaille", this method allows artists to focus on value relationships without the addition of color. Though commonly used as an underpainting for color, Rob uses the technique to create a finished work of art as he details materials, paint application, and finishing. All aspects of the work including materials, selecting a pose, basic organization, and finishing are described and demonstrated. Recognized for his classic style of figure drawing and painting, artist Robert Liberace, is also known for his inspiring and informative teaching style. Robert's portraits have been featured in International Artist Magazine and The Artist Magazine. A few of the more notable people he has been commissioned to paint include former United State President, George H. Bush, Ambassador Sol Linowitz, and the Director for the National Portrait Gallery, Marc Pachter. In addition to his success as portrait artist, he is also an accomplished sculptor and professional member of the National Sculpture Society.